And welcome to my stop in the Altenew November 2018 Stamp/Die/Ink/Sticker Release Blog Hop! 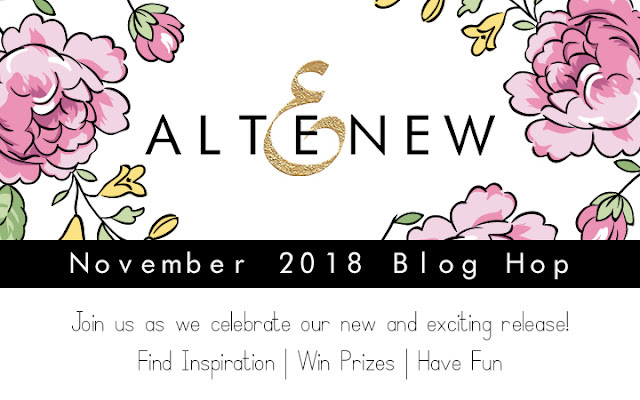 You should have arrived here from Erum Tasneem 's blog, however if you need a map, a full list of the blog hop is listed below. Get ready to see here a lot of photos and cards. New products, really, very interesting and without a doubt, deserve your attention! 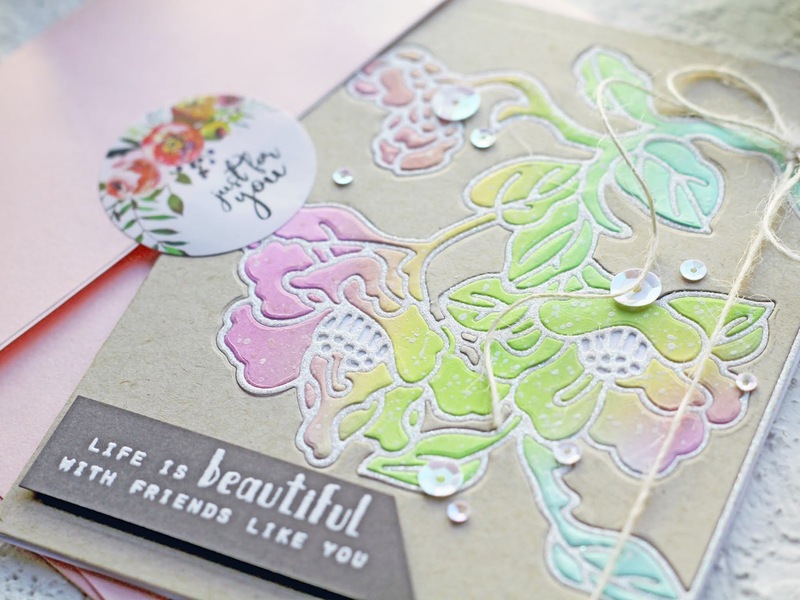 Let’s start with the new Engraved Flowers Stamp & Die Bundle! I love the beautiful details of the flowers in this set. So I decided to paint the flowers in watercolor technique, but took only one large flower - my favorite of the set - and duplicated it several times, getting a bouquet. 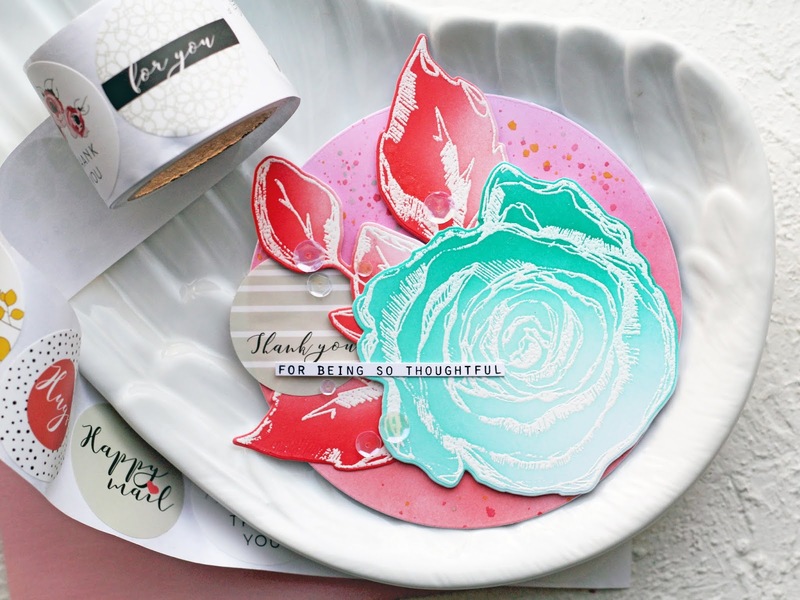 Inked Rose Stamp Set in white embossing powder. And of course some accents to complete this card. The last card is my favorite)) It is super simple, but sooo festive! It is one layered, but you can see its depth and dimensions! I started with blending a piece of the white card stock with Purple Wine Crisp Dye Ink and Cosmic Berry Crisp Dye Ink. I applied the darker shade only on the edges of the panel. Then I stamped the leaves from Wild Ferns Stamp Set on the edges. To make the depth effect I also sprinkled a little with the water for the spots and with the white and gold paint and old tooth brush for making the fireflies effect. I then heat embossed the sentiment from new Inked Rose Stamp Set in gold embossing powder. 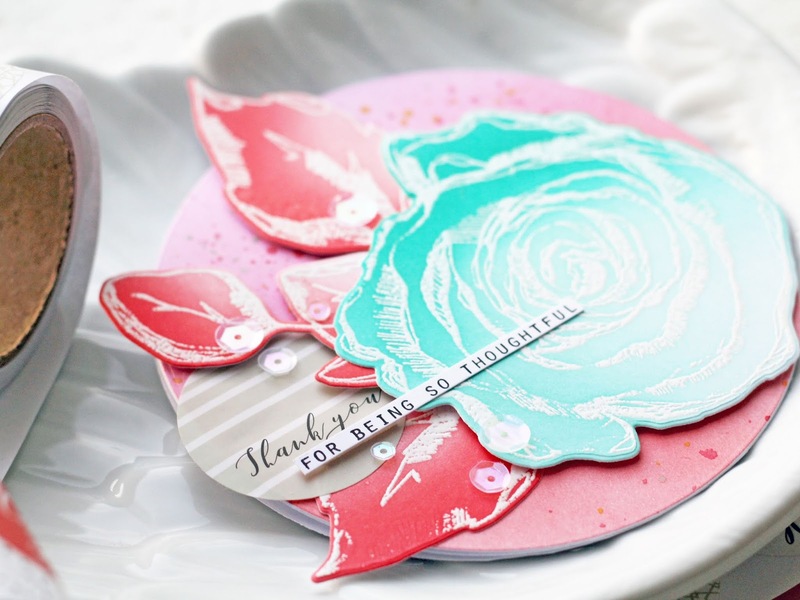 Last up are two cards featuring the new Inked Rose Stamp & Die Bundle. The design of these cards is quite simple and fast, but they turned out very charming! 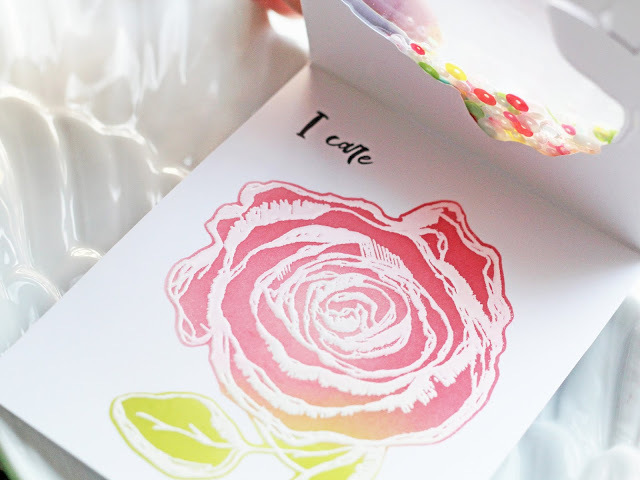 I made a through shaker by placing an image of a rose inside the base of the card. Yes, it is a little time-consuming, but the result will be interesting. I also decided not to paint the flower, and just toned it using Rouge Crisp Dye Ink and Crimson Crisp Dye Ink. For the top layer and leaves I used Bamboo Crisp Dye Ink and Olive Crisp Dye Ink. Of course, not without masking and embossing with white powder. And of course, how could I not make a round card! This version is perfect as a compliment. As a sentiment, I used the new Altenew product - Envelope Stickers. A great way to decorate not only your envelope or gift, but also a quick and fun way to highlight the sentiment on the card! For this card I used new Handpicked Bouquet Stamp & Die Bundle. This stamp set features a sweet rose bouquet that has multiple coloring layers. I started with 4.25×5.5 inches piece of the white card stock. I stamped flowers in black ink. I then die cut the masks of the masking paper and covered all my flowers. I stamped on the heavy card stock, so I used a bright lamp to shine through it and see the flowers and to adhere the masks on their places correctly. After this, I blended the entire background with the ink and then removed the masks. At the end, I added some clear drops. And my last card with the awesome Antique Engravings Cover Die. At first I toned white cardstock with different shades of ink and sprinkled it with white paint. And then I cut out the flowers using a cover die. Next, I also cut flowers from glitter and kraft paper and mixed them together, expanding the composition. Why not right? I then heat embossed the sentiment in white embossing powder. I will be giving away $30 gift certificate to ONE lucky winner from the comments left here. I will announce the winner on 11/18/2018 here. You are amazing! I love all the cards you posted. The see through shaker is such a fabulous novel idea! And I love the colors on the first card... turquoise and pink together makes me happy! Wow - what a beautiful bouquet of cards! I love your bright layers of colour, and that floral shaker card is unusual and lovely! WOW! This cards are incredible! I love all the different techniques you used, and the vibrant colours - so inspiring! Amazing cards! Love them all! Thank you for sharing and inspiring!! 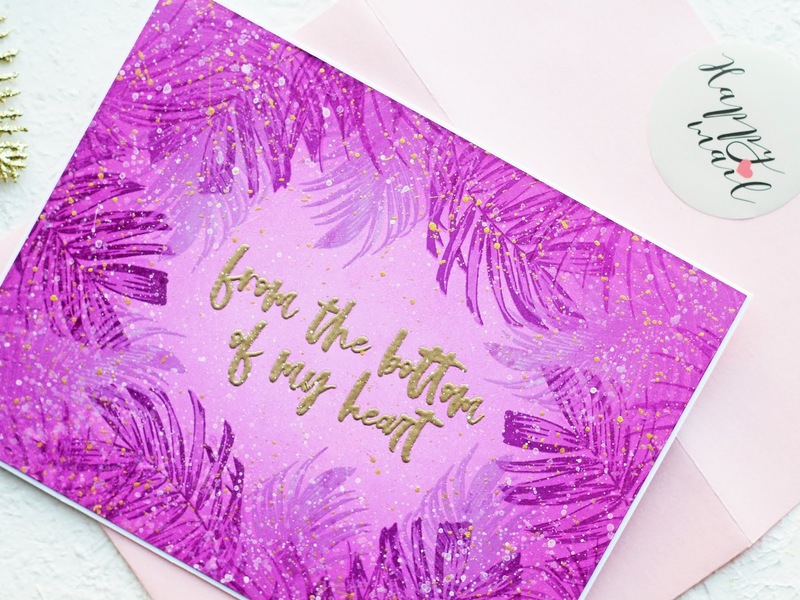 Lovely card and great to see such inspirational techniques. Thank you. Wonderful cards, love the different techniques. Thanks for sharing your inspiring ideas. Wow! Absolutely stunning. Thanks for sharing these beautiful cards. Wow! So many awesome creations! Super colorful and beautiful! Beautiful set of cards! I love those stickers as added embellishments! So beautiful and colorful! I love the purple leaves! Wow, so many beautiful, beautiful cards - your colour choices are fantastic! 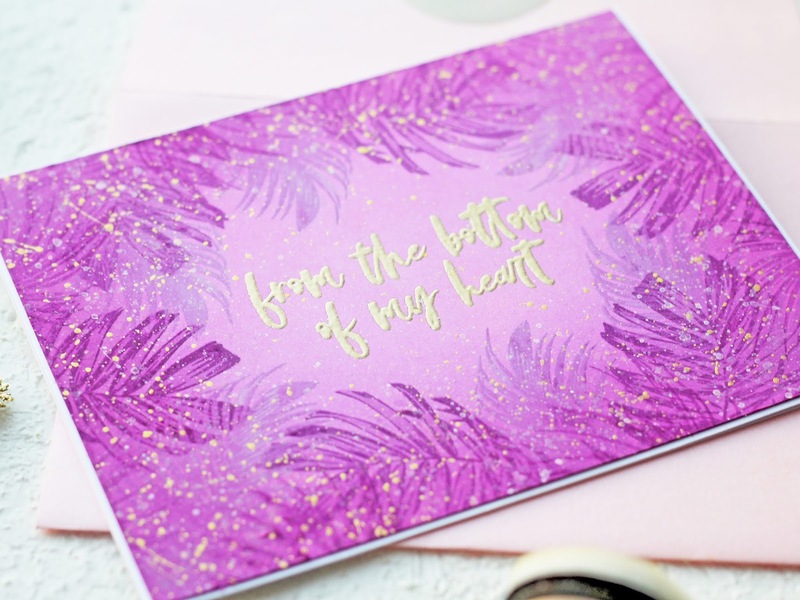 Totally in love with the purple card! Beautiful cards, great release! 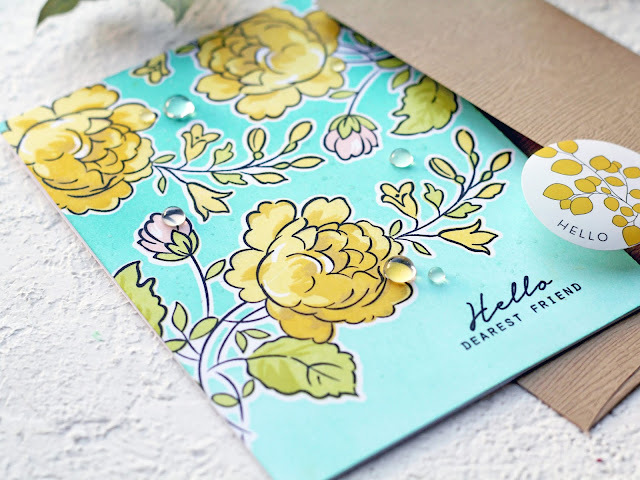 I especially love your Hello Beautiful card, the colors are so vibrant! I love your shaker card, what a brilliant idea!! Your other cards are gorgeous as well. Fabulous!! 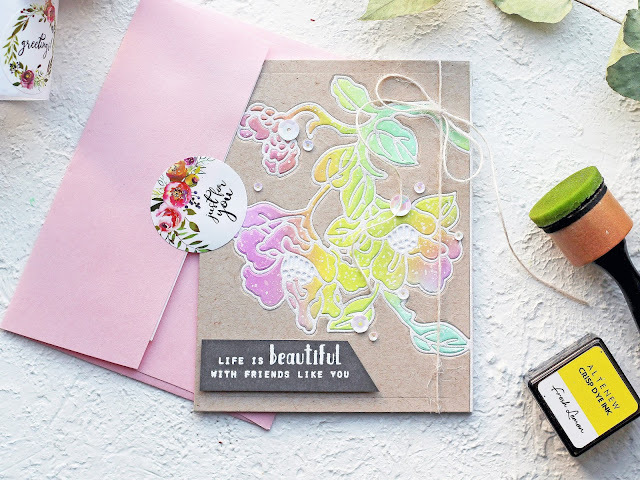 I love the new stickers and all your fabulous designs Olga, what a wonderful array of cards! Thanks for the inspiration! Wow, your cards are amazing. Love the first one with the die cut flowers over that blue panel. Olga, you are awesome. I loved the colors, so beautiful and vibrant. Beautiful cards! I like the bright blue background, and the fern that works like a frame! I love your vibrant colors! Your last card is really interesting; I wish there was a video of you making it, but I think I see what you've done. Love your cards! The first one is my favorite! The shaker card is extremely unique, just as the last card in pastel is unique as well. These cards are so pretty!! Love the shaker card. 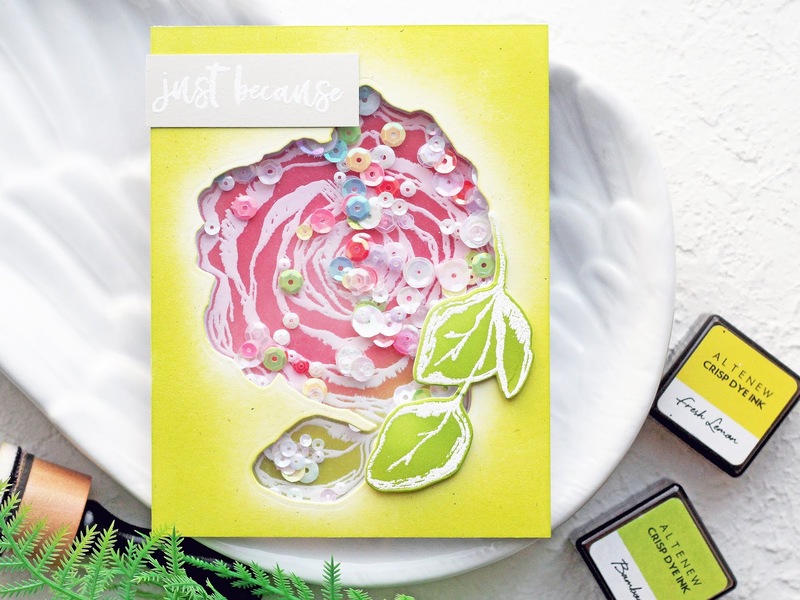 Beautiful rose -- love how you made it into a shaker! oh wow! luv your purple card!!! These are all so pretty! Love the engraved flower with the shaker card. So unique. Your first card has amazing flowers. Great job on the blending of colors. Fantastic cards. Love the gorgeous flowers! 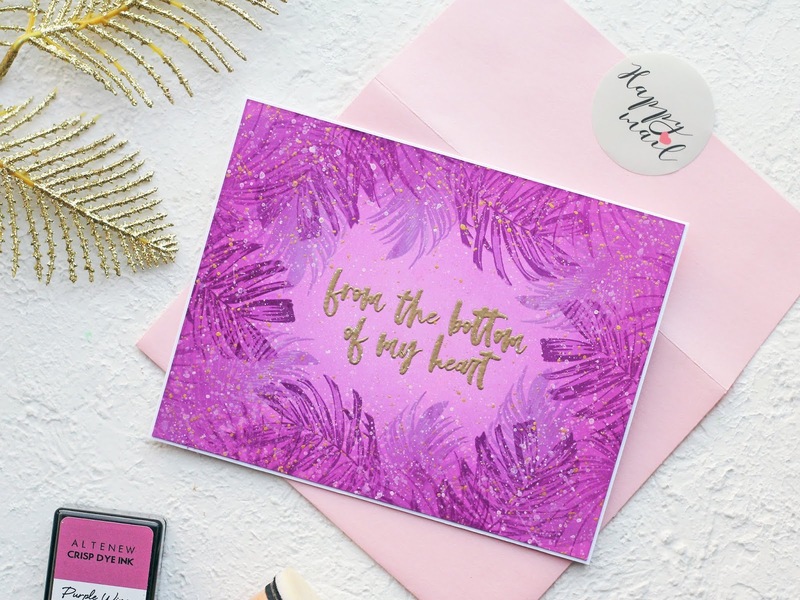 Such stunning cards ..I am so in love with your first card!! Beautiful designs!!!! I love them!! Wow, what an amazing collection of cards! Gorgeous colors, amazing vibrancy on some and sweet softness on others. Beautiful! Your cards and different techniques are fabulous. I love the colors you chose for the floral cards. Thanks for the inspiration. Absolutely stunning cards! Each one is amazing and inspiring! Beautiful! Your examples are wonderful. 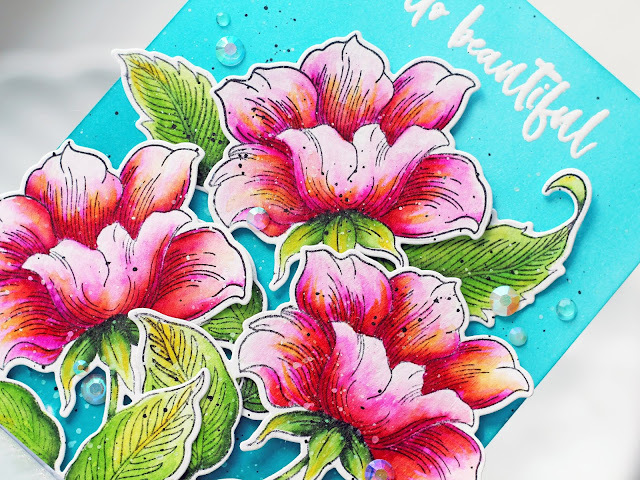 The watercolor card you did is amazing! Your cards are beautiful. I really love the engraved flowers stamp/die set. I have to say, though, that the purple ferns are fabulous! TFS! Absolutely stunning! I love the bright colors! Gorgeous, gorgeous cards. I also love the purple ferns. Awesome inspiration! They are all beyond fabulous.. love the shaker inked rose and the leafy purple card.. just beyond any words. these are all amazing! I especially love the shaker card! 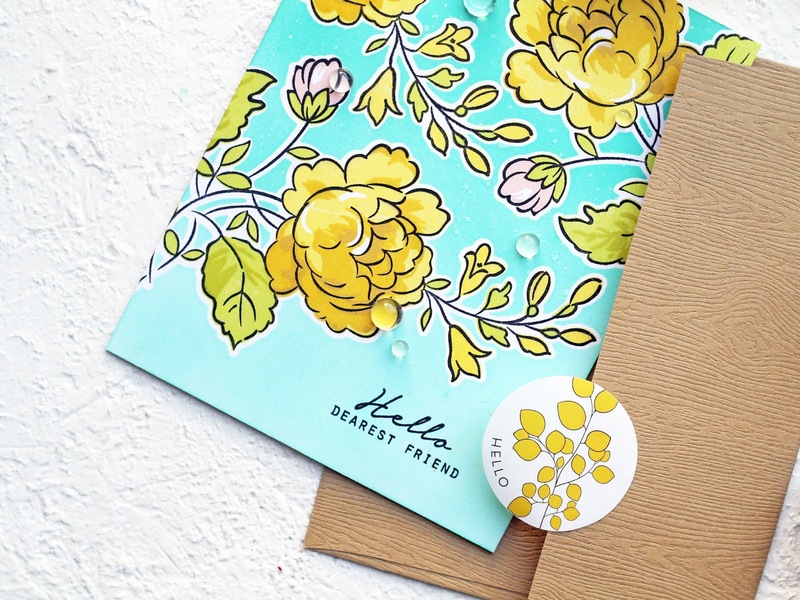 and those envelope stickers are going to be a must! Lovely cards. Thank you for sharing,. Fabulous use of all the wonderful goodies for this realease! Gorgeous projects. I love the purple ferns. This new release is spectacular and the new ink colors are amazing. I'm so impressed by the blending of the colors. I don;t think I could do it. So beautiful. Such a fantastic set of cards!! 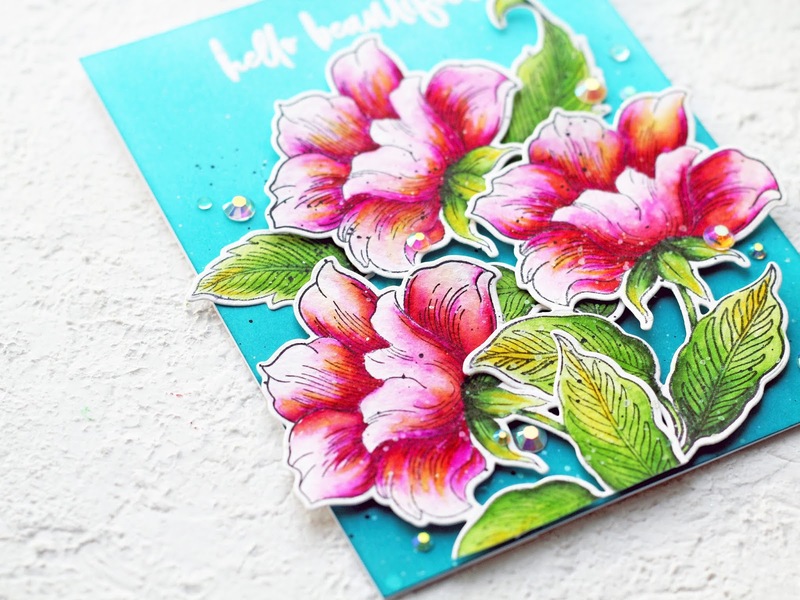 Your watercoloring on the Engraved Flowers card is so gorgeous! And, I love the card you created with the Antique Engravings cover die. Wow, these projects are all so beautiful. I love you spin of the shaker card. I'll have to try that technique soon! Your cards are so pretty! I especially like the one with the leaves and the sentiment "from the bottom of my heart." So many gorgeous cards here! I love the bright colors. That card with the greens all around the border is a stunner and I am loving that last card with the inlay. Such a beautiful look! Оля, работы для релиза просто класс! Beautiful cards! Love you color combination of your handpicked bouquet, shaker card is so creative, and the engraved flowers is just stunning! Fabulous products in the new release. Your cards are lovely. Each one is so different, I can't decide which one I like most. I'm in love with your cards! Very interesting techniques! Wow! So many awesome cards in so many different styles. I love them all, but my favorite has to be the shaker card. Great job! I like all the different directions you went with these cards, but my favorite has to be the purple one. It looks like the entrance to a fairy land; it just feels magical. Thanks for sharing all these great ideas with us! Gorgeous cards!! 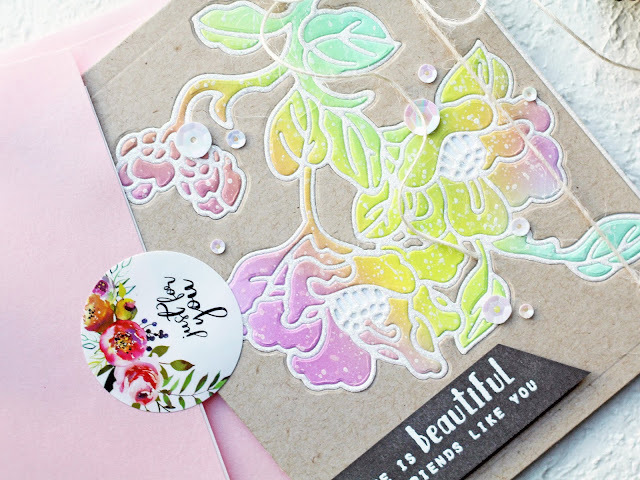 The Handpicked Bouquet stamp set is one of my favs. Awesome cards! The engraved flowers against the teal background is my favourite! I love the variety of these cards, and each one of them is absolutely beautiful. Thanks for the inspiration! I am so impressed by all of your cards! So creative and gorgeous! You blended such beautiful colors! 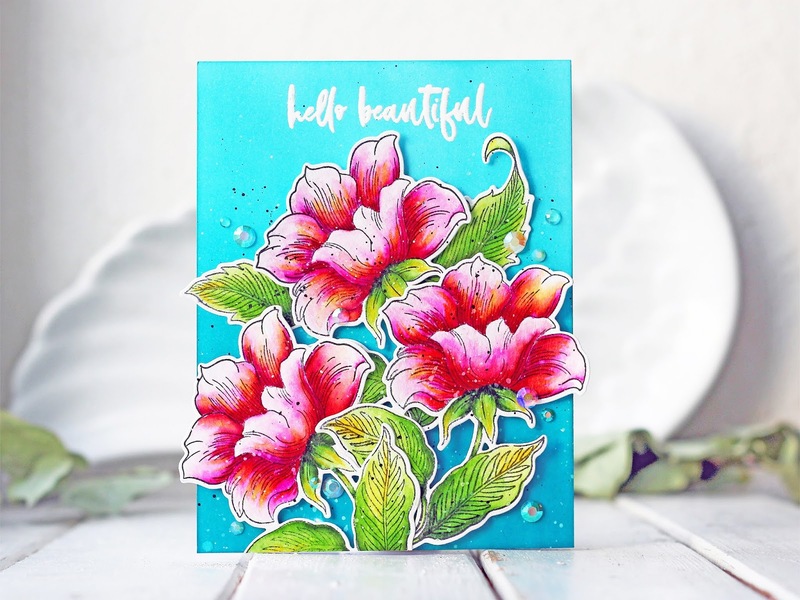 I am simply blown away by your beautiful cards! I absolutely LOVE each and every one of them!!! Thank you for sharing your creativity with all of us! Very pretty, colorful and creative cards. So beautiful, your coloring and ink blending is awesome on these pretty florals. All your stunning cards show that you had lots of fun when you made these. So bright & colourful & very inspiring, thank you. Your one layered card speak's volumes and really showcases the sentiment really well. What a fabulous release! 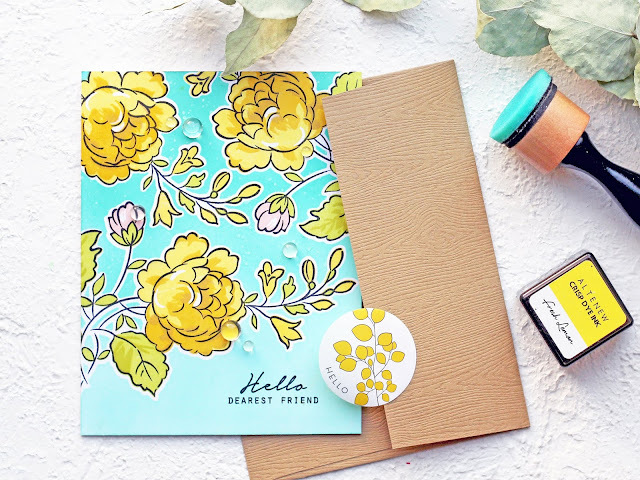 I absolutely love the engraved flowers and handpicked bouquet stamp sets & the leaf medallion die! What lovely and unique cards! Gorgeous cards! The Engraved Flowers set is a fave!